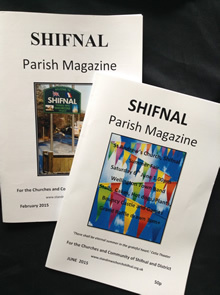 The Shifnal Parish Magazine – formerly St Andrew's News – came into being in February 2015. We believe in a local focus – informing you about the news and views of our local churches and district, past, present and future. This includes information and comments on local personalities and businesses, groups, events and developments, particularly in the light of the current expansion of the town and other proposals which will influence the future of Shifnal over the next decade and beyond. Copy for publication needs to be submitted to the editors, Chris and Sue Blake, by the 10th of the previous month. You can email them on editor@shifnalparishmag.co.uk, phone them on 01952 463171 or write to 35 Beech Drive, Shifnal. TF11 8HJ. If you would like to subscribe to the magazine, and receive it delivered free to your door (applies in the local area), then please contact Roger Etheridge on rogeretheridge@hotmail.com or 01952 291497. The subscription will cost you £5 for 11 copies, so you get one copy free each year. Magazines are available from Katrina’s Card and Gift Shop in Shifnal and also in St Andrew’s church.